Food waste is the huge issue in the world. Indeed, according FAO (Food and Agriculture organisation – United Nations), more than 41,200 kgs of food is thrown every seconds in the world. This means that 1.3 billion tons of food by year i.e 1/3 of food destined to human consumption would be wasted. FAO estimates that this food waste represents 900 billions dollars every year! Below are 9 smart ways to waste less food and save money easily. It might sound simple, but this tip is probably one of the best ways to prevent food waste. When you’re out grocery shopping, make sure to not buy in excess. Take note of food purchases you didn’t manage to finish in the past and buy less the next time. It helps to have a shopping list of necessities and actually stick to it. Discipline is key! Yeeeep, we may really love our food but let’s not cook in excess quantities. Using small plates to serve can be a good idea to limit having to big portions and not finishing our plates. Different types of food need to be stored differently – certain fruits or vegetables don’t need to be stored in the fridge, and some pantry items need to be kept in a cool dark place. For better preservation, meats should be placed at the top of the fridge (or freezer) and the vegetables in the bottom compartments. Right after your recent grocery run, organise your fridge so that older products are placed in front and new ones behind. 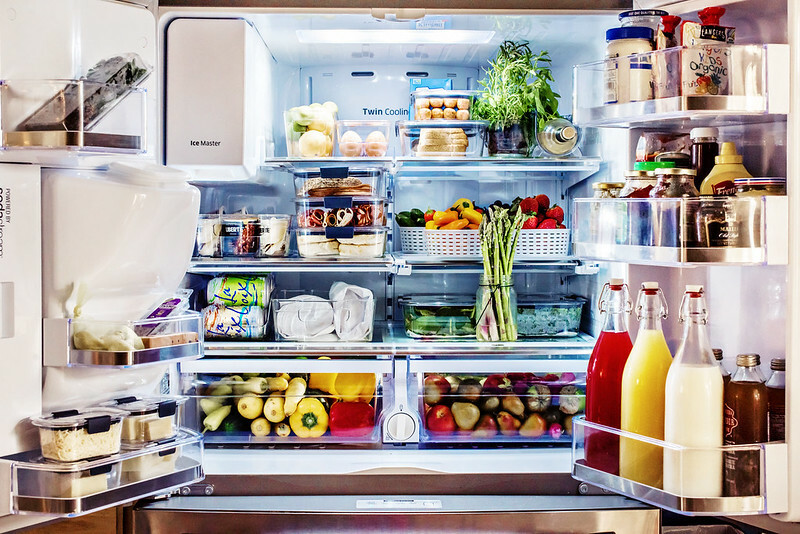 It’s so easy to forget about what is in the fridge, especially when you can’t see it. By arranging your items in your fridge, it’ll help prevent you from forgetting any older food items in your fridge and makes sure that they are consumed! If a product smells bad or has a different smell, it certainly isn’t good anymore. The date does not assure everything, even if it remains a good way to know if the product is edible or not. Certain products are “good” even after it’s best before date, but to be sure, have a look and a sniff. Trust your senses! This method allows you to keep them in perfect condition for ten months at the most. Wash your produce well, dry with a kitchen towel and store them in a ziplock bag or any container. It’s not necessary to defrost before cooking your vegetables either. Frozen fruits also are a great ingredient to include in smoothies. Just freeze any ripe fruit (like bananas or berries) and pop them into a blender when making a smoothie! 8. Convert food waste into compost! If you’re into gardening, you can use certain types of food to make compost! But all the food cannot be transformed, and it is necessary not to think “it doesn’t matter if that wastes, it will become some compost”. The less you have of compost to be made and the more you prevent the wasting! Before food becomes inedible, and you know that you aren’t gonna consume it before it expires, think of giving your food to those who really need it. Check for NGOs in your area that would accept such gifts. Or any of your friends that just really loves food! Food waste is a big issue, and these tips can be really useful to limit the consequences in your home! Of course, you can also easily combat food waste through purchasing discounted surplus restaurant and cafe treats through our Grub Cycle app. You can download for free HERE! Eating food is under-rated by many, right? Well, food is far more than simply fuel to power your body, food also brings people together in a joint celebration of delicious taste and a multitude of aromas. Food can bring light in your darkest hour through re-energising and food even has the power to bring back vivid memories of those special moments in your life, sometimes more than a photograph, through sight alone, ever could. But eating food can sometimes be embarrassingly messy too, right? It can also be surprisingly wasteful. Lo and behold, through what we like to call market research (lunch and dinner outings), we have put together 5 food hacks that will be sure to help you eat some of your favourite foods in a less messy and less wasteful way. At first glance perhaps you might be saying to yourself “I know how to eat an apple”. In fact, the majority of people do it wrong all together (yes, including New Yorkers), leaving delicious parts untouched and adding to the landfill unnecessarily. Well, we have 3 simple steps that you can follow to enjoy even more of that scrumptious apple without wasting any of it. 1 – Don’t start by eating from the side, this is common practice that leads to the apple being unnecessarily wasted. 2 – Instead, DO start by eating from the bottom of the apple. 3 – Continue eating, enjoying nature’s deliciously sweet treat until you reach the stem. Has it ever bothered you about how much juicy chicken is left on the bone and then ultimately discarded, when you and your friends dig into a tasty side order of chicken wings? Hmm, maybe it’s just us then… nevertheless, we have formulated a 3 step process to follow, so you can enjoy every last bit of that juicy wing. 1 – Twist and disconnect the cartilage. It might sound a little barbaric, but believe you me, it’ll be worth it when you get to enjoy all that extra juicylicious chicken. 4 – Dig in, you have now got yourself 100% pure boneless chicken….yum! Sometimes you just can’t beat a good ‘ol burger, but how annoying is it when that juicy goodness falls out when it crumbles and ends up on the floor, or worse, on your favourite shirt? Don’t worry we have you covered. Follow these 4 simple steps to enjoy a mess-free burger dinner! Eating a cupcake is one of life’s joyful experience, with all of those rich, delicious flavours in every bite. But are we the only ones that are left with a frosty moustache after eating? If you are like us, this food hack is just for you. Follow these simple steps to enjoy that sugary bliss. 4 – Voilà, time to enjoy the energy rush. So there you guys have it, 5 easy food hacks that you can try out for yourselves this week. If you’re looking for a fun way to reduce food waste and save money then look no further. You can now download our FREE app and purchase tasty, fresh surplus food from your favourite restaurants and enjoy up to 50% discount! Food waste is a real pain in the neck for the world. By 2050, the world needs to produce at least 50% more food to feed 9 billion people. However, 25% of crop yield may reduce due to climate change. 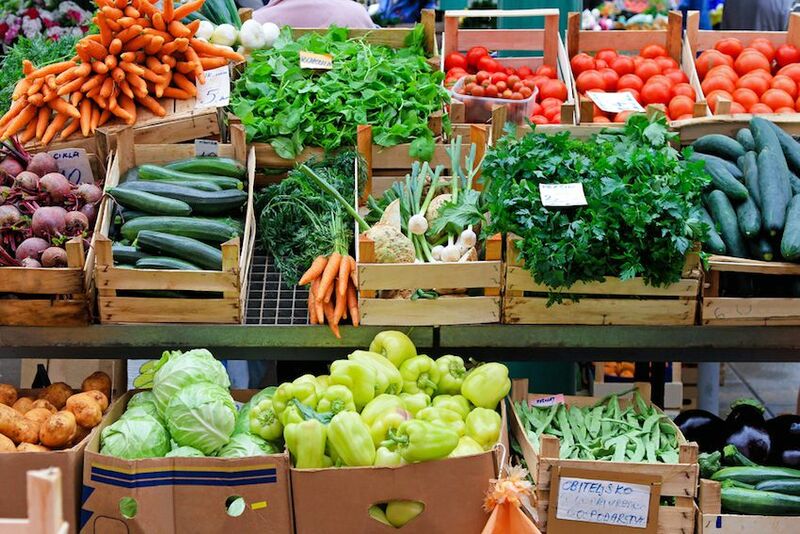 Most of the supermarkets, food manufacturing companies, restaurants, municipalities and the federal government start adopting practices and strategies for reducing food waste. It is also important for us to reduce food waste in our own kitchens! Apple peels and cores always get left every time when you ate an apple. Instead of throwing them away, you can actually make them into homemade apple cider vinegar. Apple cider vinegar can be easily made with apple scraps, sugar and water. It does take two weeks to ferment, but all great things take time! You can enjoy a jar of apple cider vinegar thereafter. Most importantly, it costs you nothing while combats food waste at the same time! Bananas ripen within a few days. A lot of us won’t eat overripe bananas simply because they don’t look to good, taste too great and they’re extra mushy. But you can simply turn that into your very own homemade banana ice cream! Freeze the overripe bananas overnight and blend them using blender or food processor to make delicious ice cream. Thanks to the high pectin content in bananas, the ice cream is creamy and rich. And yes, you only need one ingredient to make it. But of course, you can get creative and add other ingredients like peanut butter or chocolate chips to bring your ice cream up a level. We usually cook fried rice using our leftover rice. Do you know leftover cooked rice can be transformed into dessert too? With an equal part of leftover rice and milk, you can simmer it in a pot with constant stirring until it boils. Add any form of sweetener (like honey or sugar) if you like your desserts sweet and top off with cinnamon, cocoa powder or.. anything you fancy! The rice pudding can be served cold or right after cooking and you can keep your rice pudding in fridge for about 4 days. Okara is the residue of making soy milk and tofu – it contains a high amount of protein (40% on a dry weight basis) with good essential amino acid profile and digestibility. In simpler words, it’s a great substitute for meat. Simply mix the dried and mashed okara with flour and some seasoning and shape them into the shape of patties. You can bake or fry the patties upon your preference. Other than reducing food waste, you are saving the environment by going meatless! Pickling is a food preservation method that has been around and utilised for years by many different cultures. So it’s a no brainer to pickle leftover food at home to reduce food waste – you can pickle any surplus fruits and vegetables you have before waiting for them to turn bad. All you need is some vinegar, sugar, salt and water for your pickling liquid and you’re free to pickle whatever produce you want! Alternatively, you can also get your own jar of our Grub Homemade Kimchi, selling at only RM9.00 a jar.